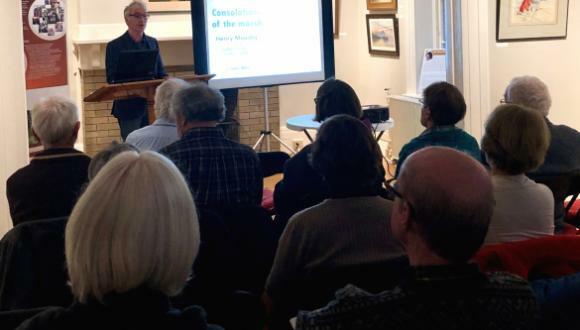 QAHN's own Dwane Wilkin brought a long-lost naturalist back to life with his presentation "Consolations of the Marsh: Remembering Henry Mousley" at Uplands in Lennoxville. Welcome to Townships Heritage WebMagazine! Townships Heritage WebMagazine is designed to provide a window on to Eastern Townships history, serve as a guide to our region's heritage, past and present, and encourage people of all ages to visit the Townships in person. Lecture-Luncheon / QAHN 2019 "Heritage Talks" Conference Series: "The Fish That Got Away," with Dwane Wilkin. "A Motley Crew": QAHN Heritage Talks Heads to Knowlton this week! "In the Days of Craftsmen: Granite Reminiscences with Charles Bullock"